Prime Minister Theresa May has insisted that a Brexit deal is still "achievable" despite deadlock in negotiations just days ahead of a crunch European Council summit. The Prime Minister was addressing the House of Commons just two days before she travels to Brussels for a summit at which it had initially been hoped to finalise the UK's withdrawal agreement as well as a political declaration on future trade and security relations. Following the failure to achieve a breakthrough when Brexit Secretary Dominic Raab met EU chief negotiator Michel Barnier on Sunday, the European Commission confirmed that no further negotiations will be held ahead of Wednesday's summit. Talks at the weekend foundered over the EU's demand for a "backstop to the backstop" designed to ensure that the border between Northern Ireland and the Republic remains open under any circumstances. Mrs May has offered to keep the whole of the UK temporarily in a customs union with the EU until a broader trade deal is in place avoiding the need for customs and regulatory checks at the Irish border, with the expectation that this will not be later than the end of 2021. But Mr Barnier insisted that a carve-out keeping Northern Ireland alone in the EU's customs area should remain available in case the UK-wide arrangement lapses before the trade deal is finalised. Mrs May told MPs that this was not acceptable as it risked undermining the integrity of the UK. The PM warned that the Irish issue must not be allowed to "derail" progress towards a deal which she said was in the interests of both the UK and EU. She told MPs she would take steps to ensure that "we cannot be kept in this backstop arrangement indefinitely". And she warned: "We are entering the final stages of these negotiations. "This is the time for cool, calm heads to prevail. "And it is the time for a clear-eyed focus on the few remaining but critical issues that are still to be agreed." Mrs May voiced her "frustration" that the Irish border issue was holding up agreement on Brexit. But she said: "We cannot let this disagreement derail the prospects of a good deal and leave us with the no-deal outcome that no-one wants. "I continue to believe that a negotiated deal is the best outcome for the UK and for the European Union. "I continue to believe that such a deal is achievable. And that is the spirit in which I will continue to work with our European partners." 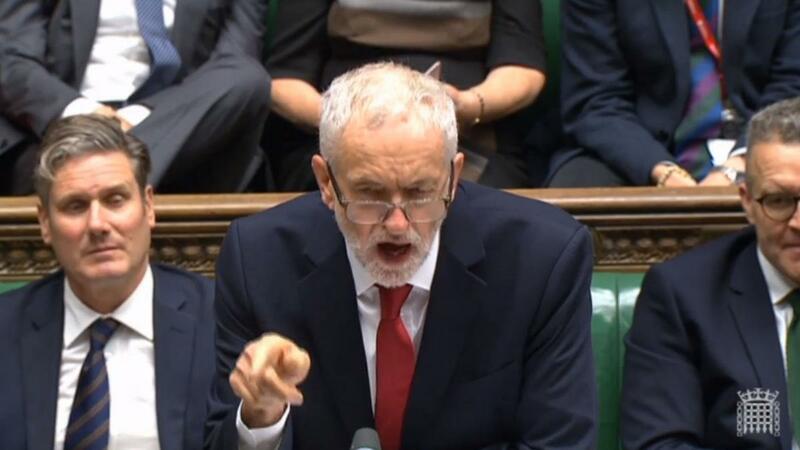 Addressing the House Of Commons, the Labour leader said: “It’s another 'nothing has changed' moment from this shambles of a Government. “Almost two and half years after the referendum, 18 months since the triggering of Article 50 and less than six months to go and what have we got to show for it?